But fitness trackers aren’t dead—or at least, Fitbit hopes they aren’t—and the company’s new Charge 3 tracker is designed for users who want some smartwatch features in a fitness tracker’s simple-band package. Even today, fitness trackers have a few advantages over smartwatches: they’re easier to wear since they have slimmer, lighter profiles. They’re less complicated because they’re designed primarily to keep you fit (not necessarily for things like emailing on the go). And, perhaps the most important distinction of all, fitness trackers are generally less expensive than smartwatches. But smartwatches have the innovation advantage these days as most companies making such devices try to develop features that competitors don’t have. As a result, fitness trackers have become a bit stale. And after wearing the new Charge 3 for nearly two weeks to see how well Fitbit’s gentle marriage of smartwatch and tracker features turned out, it seems the form factor remains radically unchanged—but that’s not a bad thing in practice. The Charge 2 was one of Fitbit’s most popular trackers, so the company stuck with the winning formula with the Charge 3. If you’re at all familiar with the Charge 2, you’ll notice that not much has changed in the updated device—it’s still a rectangular tracker hugged on its short edges by two parts of a band. 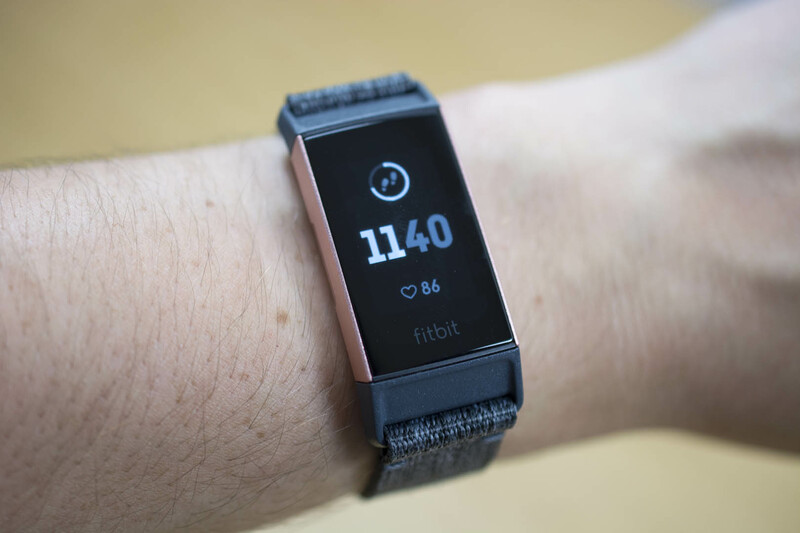 Fitbit updated the connecting mechanism that lets you switch out the bands on the Charge 3, making it easier to press the black sliver of a button on either end to release the device’s current band. The new band snaps right into place without any extra effort. The Charge 3’s module weighs in at 20 percent lighter than that of the Charge 2, so it won’t weigh down your wrist when you’re wearing it. I barely noticed it on my wrist when I paired it with Fitbit’s woven bands, which are made of a feather-light fabric material. If you’re looking for the band that both complements the device’s weightlessness and remains fashionably flexible enough to go from the gym to the office, I’d go with a woven option instead of the standard silicone one. The Charge 3’s sides are smooth, save for a small indentation on its left edge. This is the inductive button that replaced the Charge 2’s physical button and lets users navigate back on the OLED touchscreen. It also allowed Fitbit to make the Charge 3 water-resistant enough to track swimming. I’ve been pleased to see swim-tracking trickle down into more affordable devices over the past few years. Fitbit’s Flex 2 remains its most affordable device with swim-tracking features, priced at $ 60. But the $ 150 Charge 3, with its big display and smattering of smartwatch capabilities, is for a different audience than those who would gravitate to the tiny, quasi-cylindrical Flex 2. Even if you don’t swim often, water-resistance up to 50 meters means users don’t have to worry about showering with the Charge 3 or dropping it in the pool by accident. Inside the Charge 3 are an accelerometer, gyroscope, optical heart rate monitor, and an SpO2 sensor for tracking blood oxygen levels. The Charge 3 is the third Fitbit device to include an SpO2 sensor, following in the footsteps of both the Fitbit Ionic and the Versa smartwatches. However, currently the SpO2 monitor lies dormant inside all of these devices as Fitbit hasn’t made use of it yet. The company claims that the SpO2 monitor will help its devices look for signs of sleep apnea and other breathing problems, potentially great features for devices that are meant to be worn 24/7. It’ll be used primarily in Fitbit’s forthcoming Sleep Score Beta, which further analyzes sleep quality using heart rate and breathing data. Starting sometime this November, users with devices that only have heart rate monitors can get a “sleep score” after each night’s sleep. Those with an Ionic, Versa, or Charge 3 will presumably have better data thanks to the SpO2 monitor collecting breathing data. Like other Fitbit devices, the Charge 3 takes little effort to set up. It works with Android and iOS devices, and all you need is the Fitbit mobile app to use it. Choose the Charge 3 from the list of devices you can pair via Bluetooth to your smartphone or tablet, and follow the on-screen instructions. After setup, you may want to also edit basic information that the Charge 3 uses when tracking activity, such as your age, height, weight, and the activity metric you care most about (steps, active minutes, etc). The $ 150 Charge 3 has 40 percent more active screen space than the Charge 2. It’s lighter than the Charge 2 as well, but otherwise looks the same. The OLED display shows a watch face by default that you can customize in the Fitbit app. Fitbit’s woven bands (gray) are super light and arguably the most comfortable to wear with the Charge 3—even more than the regular silicone bands (lavender). The optical heart rate monitor sits on the underside of the module. The new inductive button provides haptic feedback when you press it. It also allows the Charge 3 to be swim-proof. The dashboard shows your activity stats at a glance, including steps, calories burned, and more. All alerts live in the notification drawer, accessible by swiping down from the watch face. App icons are simpler versions of those on Fitbit’s smartwatches. Exercise profiles are accompanied by cute stick-figure animations. Quick-settings let you turn off the raise to wake feature and mute notifications. The Charge 3 works continuously throughout the day to track steps, distance, calories, floors climbed, and heart rate—the standard array of activity data. Fitbit has been tracking these metrics for so long, without making many significant updates as of late, that they are business as usual on the Charge 3. I appreciated that most of the watch faces available for the Charge 3 show your real-time heart rate, either in a corner or at the bottom of the rectangular display. I like being able to glance down and know my pulse. You can choose from five different watch faces for the Charge 3, making it less customizable than the Ionic or the Versa. Those smartwatches have the advantage of running Fitbit OS, which includes a library of many third-party-developed watch faces. The Charge 3 isn’t a smartwatch, so its version of Fitbit’s software isn’t as robust as what we see on the Ionic and the Versa. It’s not as critical for the Charge 3 since it isn’t designed to run more than a few basic apps, but those looking for interesting watch faces will have to do with just a handful of options. I visited the Fitbit app more than I usually do during the first day of wearing the Charge 3 so I could manage notifications. This device is the first tracker to go beyond the basic call, text, and calendar alerts that most Fitbit trackers can receive. The Charge 3 can alert you to any and all happenings on your smartphone if you want. In the notification panel in the Fitbit app, you can choose which apps you want to receive alerts from—turn on all of them so you never miss a beat, or only turn on the apps that are most important to you. I go for a middle-of-the-road approach—I enable alerts for most of my installed apps, save for ones that are niche (mostly shopping apps that alert me to coupons) or ones I don’t use regularly. All alerts make the Charge 3 vibrate and show the message on its screen, and all past alerts live in the notification drawer that you can access by swiping down from the top of the Charge 3’s display. Unfortunately, you won’t be able to respond to alerts (like messages and emails) from the Charge 3. That’s a feature sequestered to smartwatches, but you can see most of the content of an alert on the device’s screen. Considering how narrow the device’s screen is, reading through a long email won’t be the most comfortable experience. But at least that message will be glanceable on your wrist, as will news headlines, text messages, and other alerts as well.